Fatehpur Sikri, a UNESCO World Heritage site, is a charming planned city built by Akbar in honour of Sufi saint Sheikh Salim Chisti. It served as his capital and court from 1572 to 1585. It is one of the finest examples of Indo-Islamic architecture, blending chhatris, jharokhas, and motifs of Indian and Rajput architecture. Sikri is an ancient site near a dried-up lake. Rock shelters with paintings and stone tools of the primitive man have been found in the area. Ochre colored pottery (c. 2nd Millenium B.C.) and Painted Grey Ware (c. 1200-800 B.C.) has been found in the region. It is said to be mentioned in the Mahabharata as “Saik”, a region surrounded by water. It is mentioned in an inscription on a sculpture of Jaina Saraswati (c. 1010 A.D.) as “Sekrikya”. Babur mentions Sikri in his memoirs Babur-i-Nama, and built a garden, stepwell, and Jal Mahal, palace surrounded by water, to commemorate his victory in the Battle of Khanwah. 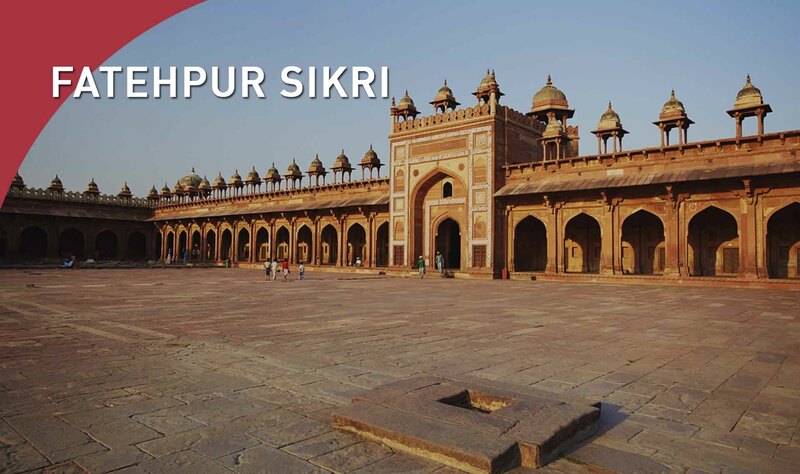 The monuments of Fatehpur Sikri have been built of red sandstone, with an efficient system of drainage and water supply. It features terraces at different levels, with different complexes. One complex consists of Jama Masjid, Buland Darwaza, and the marble tomb of Sheikh Salim Chisti. The other complex consists of Panch Mahal, Khwab Gah, Diwan-i-Am, Diwan-i-Khaas, Anup Talao and Chaupar.